United States Pictures / Warner Bros. In the territory of New Mexico at the turn of the century, a handsome, sloe-eyed man named Jeb Rand (Robert Mitchum) is hunted across a desolate landscape by gunmen. He returns to the cabin where he was found as a boy and prepares for a showdown. The mountains that surround the cabin are drenched in shadows, and they tower above the tiny human figures below them like skyscrapers. As Jeb waits, he is plagued by nightmares of boots on wooden floors — boots with jangling spurs — but he can’t make sense of his strange visions. 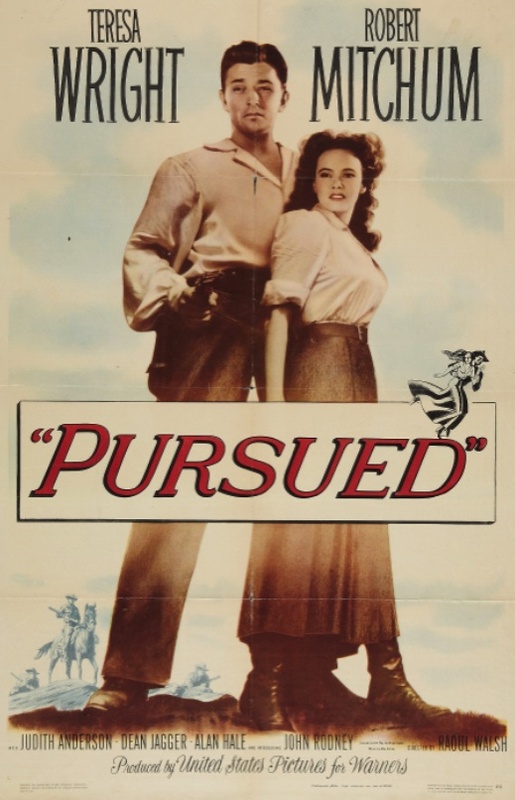 Pursued is a western, not a film noir, but it has all the hallmarks of noir, including stunning black and white cinematography by the great James Wong Howe, Freudian relationships up the wazoo, the sins of the past coming back to haunt the present, a man on the run, plenty of sinister characters packing heat, and a story mostly told in flashback. Young Jeb Rand (played by Ernest Severn) survived the massacre that killed his family and was taken in by Mrs. Callum (Judith Anderson), who has two children about Jeb’s age — Thor (short for “Thorley”) and Adam. They’re played by Peggy Miller and Charles Bates as kids, and by Teresa Wright and John Rodney as adults. Jeb often complains that his head hurts. Nothing about his past makes sense, and his present is equally confusing. Thor and Adam don’t treat him as a brother. (His separation from them is represented visually as well as thematically. In one scene in which the family gathers, Mrs. Callum stands in the center, with Thor and Adam on one side of her and Jeb on the other.) Adam hates his adopted brother Jeb. Thor loves Jeb, but her love seems more romantic than sisterly. One day, someone shoots young Jeb’s horse out from under him. Mrs. Callum tells him it was probably just careless deer hunters, but Jeb is convinced that it was Adam. 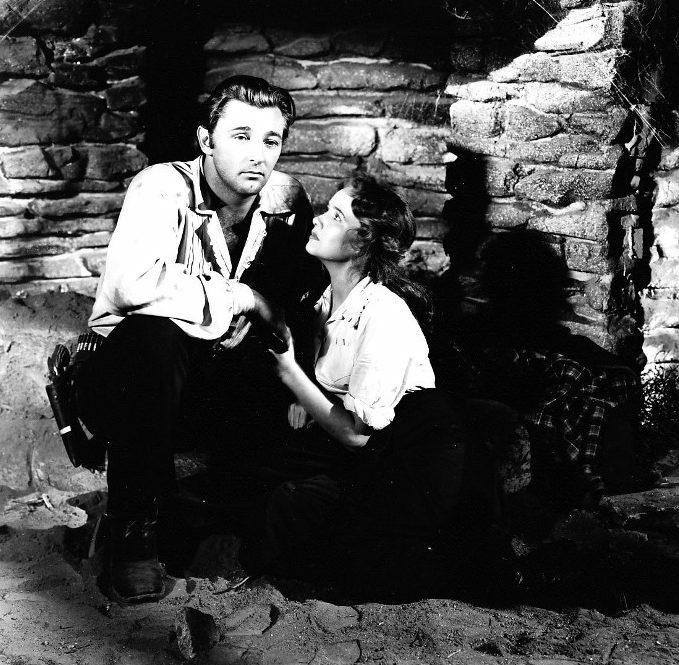 We eventually learn that Mrs. Callum’s brother-in-law, Grant Callum (Dean Jagger), led the attack on Jeb’s family. Grant’s brother (Mrs. Callum’s husband) was killed in the attack, and Grant was wounded and had to have his arm amputated. Grant vowed not to rest until every last Rand on earth was dead. Mrs. Callum, on the other hand, considers the events of that night Providence — the Lord may have taken her husband, but He delivered unto her a second son. Jeb, Thor, and Adam grow to adulthood. When the draft board demands that at least one young man from every family in the territory enlist to fight in the Spanish-American War, Jeb and Adam flip a coin. Jeb loses. Grant Callum dogs Jeb’s every move, sending shooters after him even though he clearly just wants to be left alone. After he’s forced to kill two men in self-defense, Mrs. Callum and Thor shun Jeb, and tell him that he’s dead to them. Pursued has a happy ending, but that doesn’t stop Jeb and Thor’s semi-incestuous love from having a doomed quality. “There was a black dog riding my back and yours,” Jeb tells Thor as they reminisce about their past while waiting in the burned-out cabin together for Grant Callum and his gunmen to arrive. This noirish sense of doom pervades the film. So many scenes take place at night or indoors — in smoky saloons and casinos — that the film has a powerful sense of claustrophobia. And the fact that Jeb is a returning combat veteran plagued by nightmares gives him more in common with many of the protagonists of post-war film noirs than it does with the cowboy heroes of most post-war oaters. Posted in 1947, March 1947 and tagged Alan Hale, Charles Bates, Christian Nyby, Clifton Young, Dean Jagger, Eddy Waller, Elmer Ellingwood, Ernest Severn, Harry Carey Jr., Ian Wolfe, Jack Montgomery, James Wong Howe, John Rodney, Judith Anderson, Kathy Jeanne Johnson, Lane Chandler, Max Steiner, Mickey Little, Milton Sperling, Niven Busch, Norman Jolley, Peggy Miller, Pursued, Raoul Walsh, Robert Mitchum, Scotty Hugenberg, Teresa Wright, Tom Fadden, United States Pictures, Warner Bros., Westerns. Bookmark the permalink.